Discuss about the Article on Physical Examination and Health Assessment? Health history assessment refers to the systematic appraisal of all factors relevant to a client’s health, and the main components of such an assessment are health history, physical examination, records and reports and review of developmental, psychosocial and cultural considerations (Jarvis, 2015). The purpose of such assessment is to identify interdisciplinary assessment parameters and define the responsibilities for planning and delivering the appropriate level of care for meeting the patient needs and evaluating the response of care (Wang et al. 2012). The present report is a health history assessment and a reflection of the thought processes, actions, and behaviors in order to evaluate outcomes. It describes the experience of conducting this health history. Demographic data – Mercedes Garcia is a 70-year-old lady. She is a native of he United States. English is her second language, and she struggles with the conversation. He lives with her family of a son and his family. Perception of health – She is 5′ 1″ in height, and she weighs 138 lbs. She has lost 2 pounds in the last two months. She has complaints of generalised joint pain, and she denies the requirement of anything to control the pain. She feels signs of angina while walking for longer distance or taking up stress. She consumes alcohol on a regular basis. Past medical history – She suffers from hypertension and cardiac disease. Family medical history – Her mother had died of cardiac arrest at an early age. Her father also suffered from hypertension during his lifetime. Integumentary: The hair is mostly grey in colour and very thin. The skin is wrinkled and patchy and arms and face. Nails are short in length and the left feet thumb has nail slightly discoloured. Facial skin shows signs of sun burn. Respiratory: The patient has difficulty in breathing and gets such conditions particularly while walking fro a long time. Mental status: The patient is in good mental health and has no signs of dementia and depression, the two common mental health problems of old age. There are no developmental considerations at this time. The patient is 70 years of age. He is therefore in the eight stage of life span, that is, wisdom. In this age, a person slows down his productivity and explores life in a relaxed manner. The patient has also contemplated her accomplishments and is able to develop integrity as she has been leading a successful life. There are some cultural considerations. The patient is from Hispanic background. Clear and effective communication is vital when taking care of patients who are from some particular backgrounds. Communication leads to building up of respectful and trusting relation between nurse and patient when addressing an elderly patient of Hispanic culture. Formal forms must be used for assessing the level of acculturation. The patient is concerned about her health and wants to remain healthy in the future. The two body systems for performing a physical assessment are circulatory system and respiratory system. The teaching and learning need priorities are patient education on management of high blood pressure and cessation of drinking. Collaborative resources- The patient’s family was interviewed for the collection of data. My interaction with the patient was a fulfilling one. I had learnt in my nursing college that for taking care of patients who are at the old age, there needs to be patience and gentleness shown by the nurse. I experienced the same while taking of this particular patient. As she was a 70 year old lady and into the later stages of life, I had to be much gentle and kind with her in order to cause no harm to the emotions. The whole conversation went well, and I was able to establish a strong relationship with her. She trusted me with her medical details and showed confidence in me. There was one barrier to communication as she belonged from a Hispanic background and was not able to understand English well. Non-verbal cues and signs were effective in exchange of communication. I have learnt that non-verbal cues are effective for communication and will use such means in future. There were no as such unanticipated challenges to the interview. I would conduct such interviews with mich more care and details in the future. Jarvis, C. (2015). 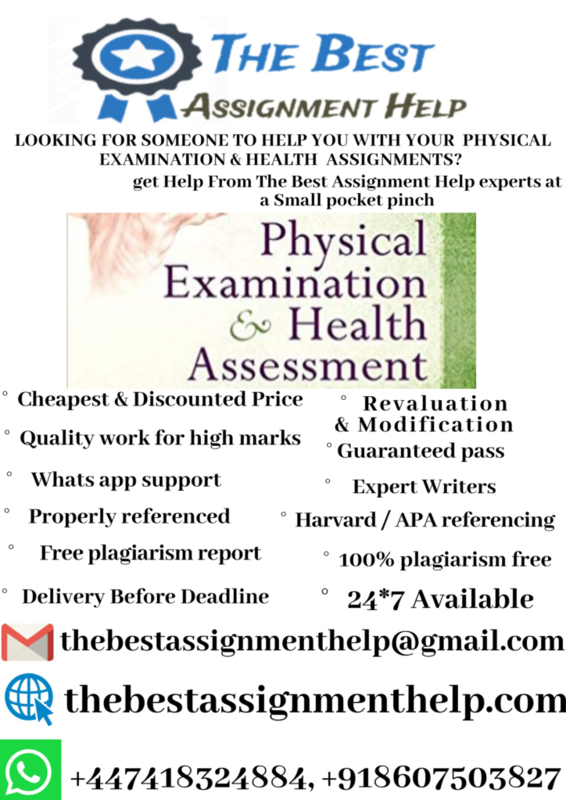 Physical Examination and Health Assessment–. Elsevier Health Sciences. thebestssignmenthelp.com has been satisfying students’ needs over a decade now. With years of experience in providing assignment help, we are capable of understanding students’ requirements better and fulfill them perfectly. To meet the students’ needs, we have appointed 3000+ experts, who cover more than 100 subjects while assignment help. Some of our popular services include corporate finance assignment help, MATLAB assignment help, database assignment help, operating system assignment help and web development assignment help.